Our heartfelt thanks and appreciation for the loving care our mother received during her years at Prestonwood Rehab. We especially thank the nurses and CNAs for the friendship extended to mother and to us. We will always have a special place in our hearts for each of you. 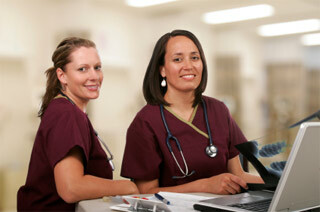 Linda S. and Sandra C.
Our team of Licensed and Registered Nurses are attentive to your needs 24 hours a day. Your recovery plan will be lead by these expertly trained skilled nurses who will work individually with you to provide the optimal nursing care and attention you require. Your skilled nursing care will include ongoing evaluation and assessment to ensure you achieve the fullest recovery. Located just minutes from medical offices and hospitals in Plano, Carrollton, Frisco, Lewisville and North Dallas, our skilled nursing staff will coordinate your follow-up medical appointments and procedures, including door to door transportation in our comfortable van equipped with a wheel chair lift. You can depend on our expert skilled nursing staff to provide passionate and high-quality care and support during your stay.